GOLDEN DUI & THE AXIS OF SILENCE – Alternate Comms. 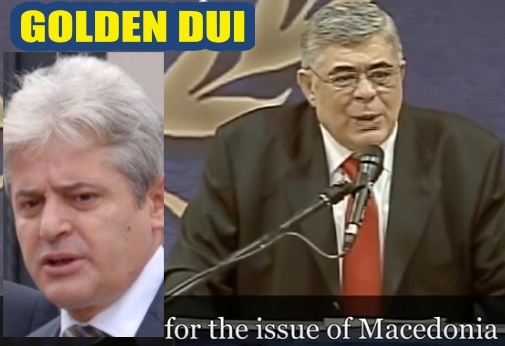 There isn’t that much difference between Nikos Michaloliakos of Greek Neo Nazi Golden Dawn and Ali Ahmeti of Albanian nationalist party in Macedonia, DUI (or BDI). 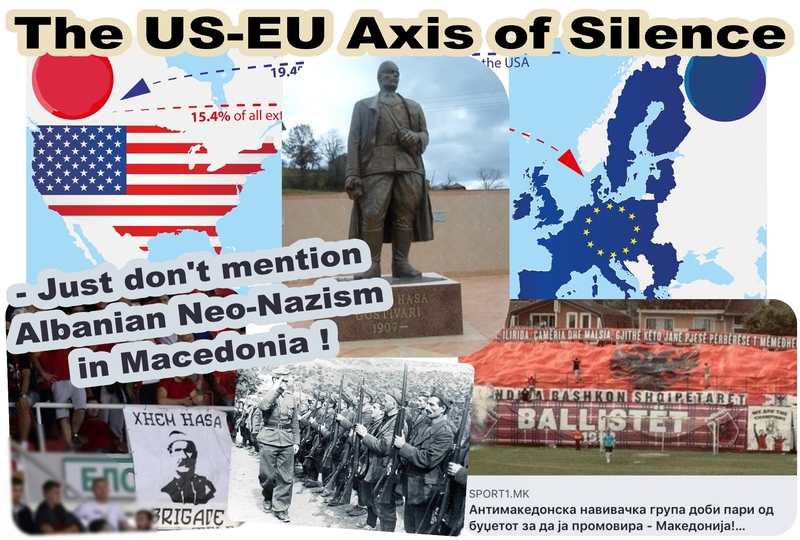 Ahmeti has gone “one better” than Golden Dawn, he’s actually managed to impose World War II Albanian Nazi collaborator statues in Macedonia -post-2001 – without the EU or US batting an eyelid. Nazi statues are banned in Germany – an EU and NATO member. 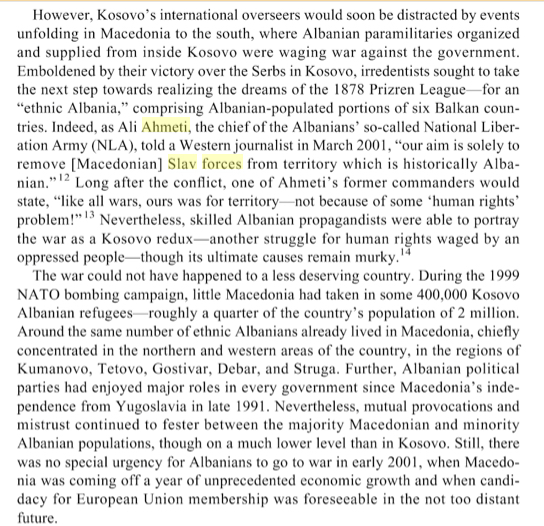 Yet Ahmeti has managed to get EU tacit approval to build Albanian Nazi statues in Macedonia. That’s an incredible and frightening phenomenon which he has managed to pull off. Something Golden Dawn hasn’t managed to do in Greece – build Greek Nazi collaborator statues. The amended Macedonian Constitution now enshrines the Ohrid Framework Agreement, the US’s get of jail card for letting loose the KLA in Macedonia in the 2001 war. 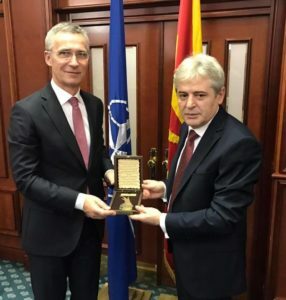 Not surprisingly post 2001 war, former KLA commanders in Macedonia such as Nevzat Bejta, now a loyal Ahmeti lieutenant, felt confident enough, no doubt with tacit US and EU approval or at least a willingness for Washington and Brussels to remain silent, to embark on a program to build – first in 2006 and later in 2013 – statues to notorious World War II Albanian Nazi collaborators such as Xhem Hasa Gostivari, who murdered Macedonians and Albanians opposed to fascism. Such statues don’t represent “peaceful ethnic co-existence.” They are a deliberate message, reminder, to Macedonians of what the majority of the Albanian political bloc in Macedonia really believes in, despite the Western spin and gloss, polish placed on Ahmeti and others such as another DUI party member Bujar Osmani, deputy Prime Minister of Macedonia in the Zaev coalition government. The interesting thing is Nazi statues are banned in Germany. But here in Macedonia, which has a proud history of an anti-Nazi resistance movement, the Partizans, there were now Albanian Nazi collaborator statues. 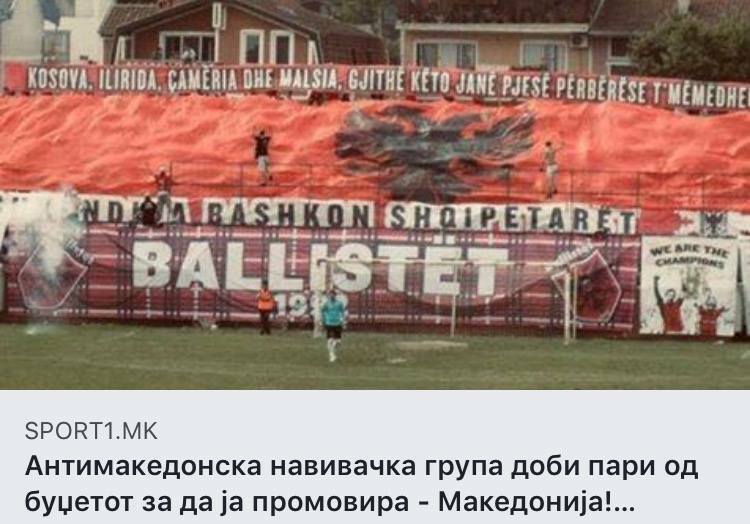 For more than a decade there has been an incredible silence which even now still continues in and outside of Macedonia. Not one US or EU official is willing to comment or condemn or even explain the unwillingness to comment about World War II Albanian Nazi collaborator statues in Macedonia. 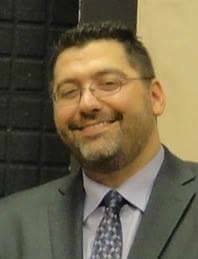 The reason is obvious – if the US and EU need the support of extremists, Albanian Neo-Nazis such Ali Ahmeti, to achieve their objectives in Macedonia what does that tell you about the values espoused by the US and EU? So silence has become a deliberate strategy. In essence, those who venerate Nazi collaborators don’t really believe in democracy or human rights or even co-existence, otherwise, why would you regard them as “heroes” to begin with? 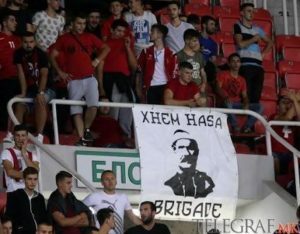 The Ballist football supporters even received a Macedonian government grant from the Culture Minister, an Albanian belonging to the Besa party, which was seen as offensive by Macedonians. NATO Secretary General Jens Stoltenberg endorsing Ali Ahmeti, as have EU and US officials. Macedonia doesn’t have a long term future within or without the EU if a segment of the population and its “mainstream” politicians hold Neo-Nazi views such as the Albanian political bloc. That doesn’t make for peaceful vo-existence. Albanian Nazi collaborator Xhem Hasa Gostivari took part in ethnic cleansing of Macedonians during World War II. He also murdered Albanians who didn’t support fascism. Building a statue to him post 2001 signifies that Albanian leaders hold these alarming views now in the 21st century. The EU and US deliberately say nothing. Just to reiterate, as we have pointed out above, there isn’t that much difference between Greek Neo-Nazi Golden Dawn and Albanian nationalist party in Macedonia (DUI/BDI): both believe in ethnic cleansing, part of the Neo-Nazi mantra. 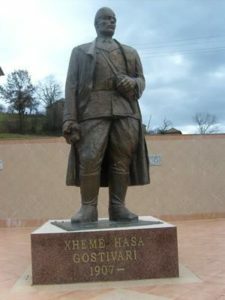 DUI has gone one step further, it has supported the building of statues to WWII Albanian Nazi collaborators such as Xhem Hasa Gostivari. Gostvari was financed by The Third Reich and took part in ethnic cleansing operations during WWII. One of Ahmeti’s commanders: “Like all wars, ours was for territory – not because of some human rights problem! 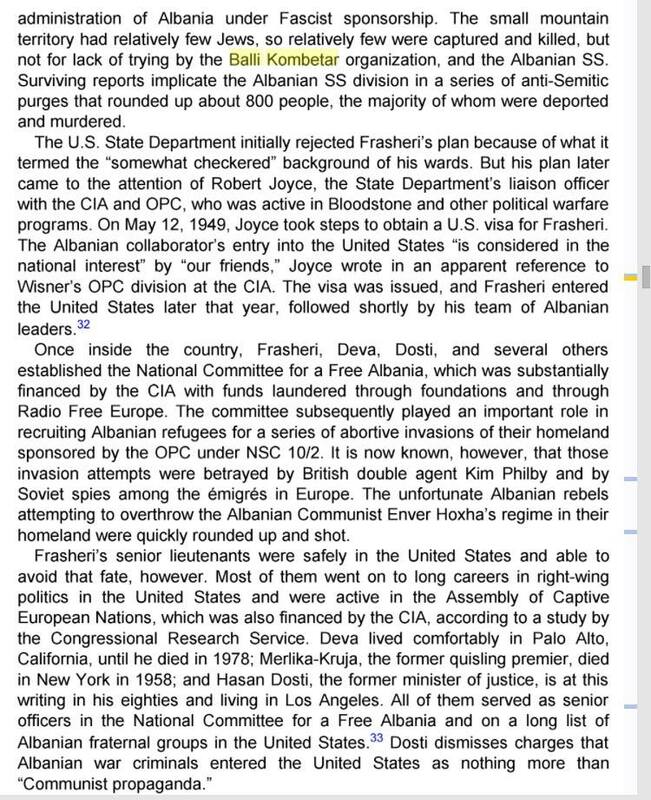 US AMBASSADOR REEKER remained silent about WW2 Albanian Nazi collaborator statues built in Macedonia by Albanian leaders but later cynically became Special Envoy for Holocaust issues! 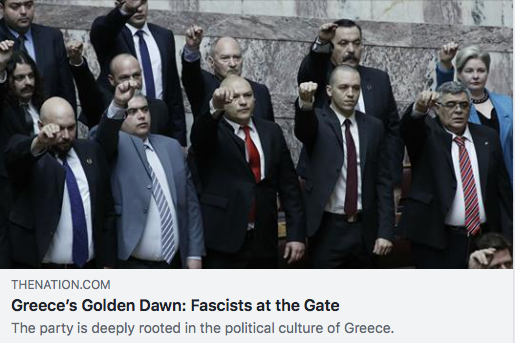 Imagine if a US Ambassador in Athens met with Greek Neo-Nazi Golden Dawn leader and had a media photo session with handshakes and smiles. What would the reaction be? Probably condemnation. Yet in Macedonia back in 2010 US Ambassador Philip T. Reeker is all smiles with Albanian nationalist leader Ali Ahmeti who has supported the building of WW2 Albanian Nazi collaborator statues! Later, Reeker cynically becoming the US State Department envoy for Holocaust issues! No shame. You can see below the list of people – US, EU officials, Macedonian and Albanian “experts” – all refusing in some manner or another to comment on Albanian Neo-Nazism in Macedonia.